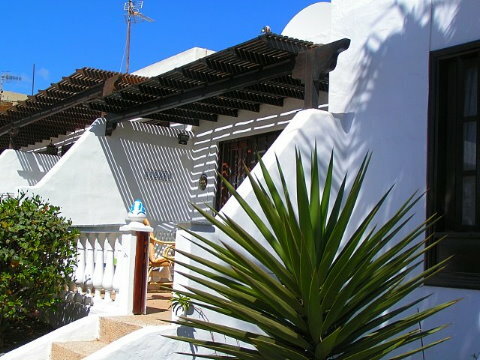 Playa Bastian is a bungalow in a cozy holiday resort with the same name in Costa Teguise, located directly at the ocean at the Playa Bastian beach. The resort consists of several bungalows and apartments, that are loosely arranged around a beautiful swimming pool. At the swimming pool there is also a small bar with a terrace that invites you to stay a while. To reach the ocean and the beach, you only have to walk for about 50 meters. From the terrace of the bungalow you have a view of the swimming pool that is located about 35 meters away. From here, you also enter the apartment. In addition to a large and comfortable living room with an integrated kitchen and dining table for four persons, there is a bathroom (with a washing machine), as well as the bedroom with a wonderful, enormous bed. In principle, two people can stay her, but since there is also a daybed in the living room, it would be possible to live here with 3 persons, for example with a child. 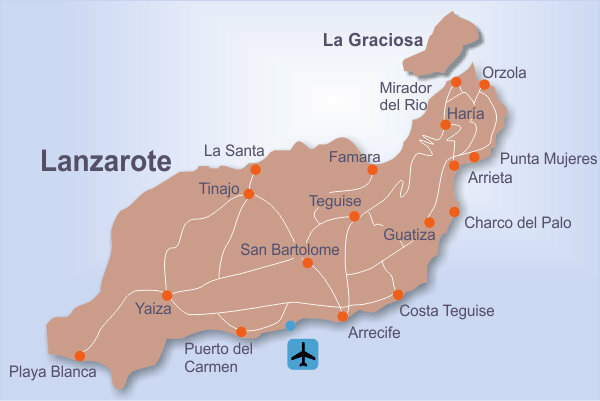 Costa Teguise is the smallest of the three tourist areas on Lanzarote, and thus the calmest of them. There are resaturants and supermarkets in the immediate vicinity. Approx. 1 km away there are surfing schools / diving centers / an aquapark, the Costa Teguise golf course and other recreational facilities. To Golf Costa Teguise you have to drive approx. 3 km. Rent per night 45,- Euro, final cleaning: 45,- Euro. The prices mentioned apply per night for 2 persons. If you travel with your children sleeping on the bed-sofa in the living room, we will charge 5,- per night in addition..